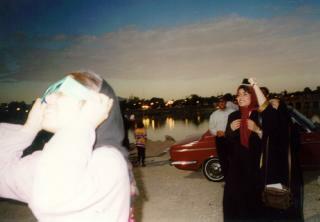 In August of 1999 I traveled to Iran to view the total solar eclipse from Esfahan (which you'll also see transliterated from Farsi as “Isfahan”—in this document I use the more common transliteration which is by far the most commonly seen in Iran itself). 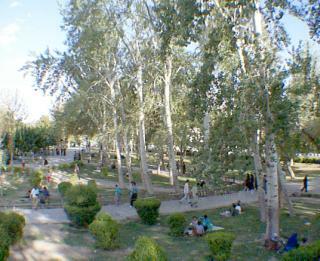 Esfahan is a beautiful city of about a million near the centre of the country, surrounded by high desert which makes for excellent weather at the time of the eclipse. 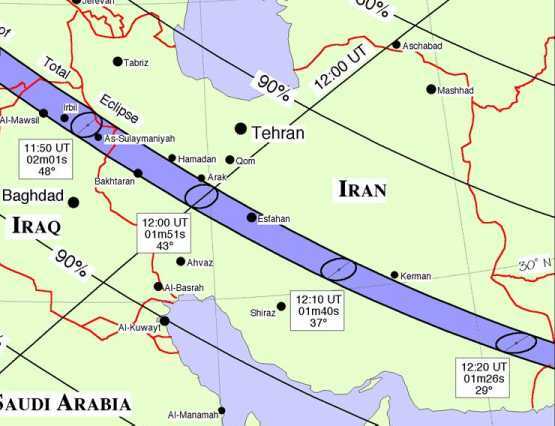 Here's the eclipse track through Iran. Only rarely do eclipses occur in places which are easy to get to (this is a natural consequence of the small percentage of the Earth's surface which is densely inhabited and has a commensurate transportation infrastructure). 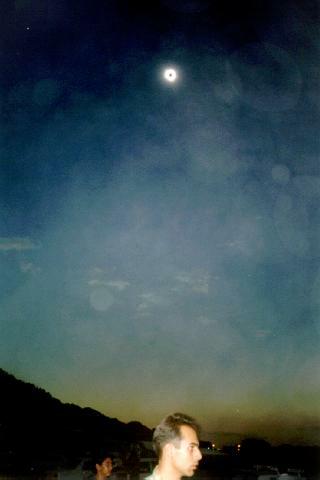 The eclipse of August 1999 was a welcome and spectacular exception to this rule—the path of totality swept across England, France, Germany, Austria, Hungary, and Romania—not far from the major cities in each country, before crossing the Black Sea (turned black with eclipse expedition cruise ships) into Turkey and points east. So why, if you live in Europe, depart for one of said “points east”? The weather. Here's a chart of the probability of clear skies on the day of the eclipse. So while the probability of clear skies was on the order of 50% in most of Europe, an observer in Esfahan had in excess of 95% chance of cloudless skies. Let's go! (Actually, cloud cover in much of Europe tends to be local in August, and observers with wheels who are willing to brave roads packed with other half-daft eclipse chasers can increase their probability of viewing a cloudless totality above the raw cloud cover percentage. Still, 95% gives you a lot more confidence than fifty/fifty, so I opted for the peak of the probability curve—and it paid off! When the eclipse track passes right through a major city, the task of choosing an observing site is drastically simplified. 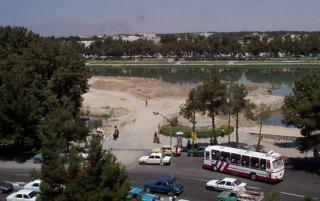 Here's a more detailed view of the path of totality through Esfahan. While Esfahan is not precisely on the centre line, the curve relating distance from the centre to duration of totality is broad and flat, so one would gain only about 15 seconds more totality by travelling to a location on the centre line. Given the need to catch a flight to Shiraz not long after the end of the eclipse, I decided to forgo the small increment in totality and observe from the south bank of the Zayandé River which flows through the centre of Esfahan. There's a nice park along most of this bank, but the park seemed pretty crowded hours before the eclipse, and clear views in the direction the eclipse were obscured in many locations by, of all things, the many birch trees that grow there. I opted for a much less lush setting, in what appeared to be a construction site (shown at left) just to the west of the end of the park. This was just an open expanse of packed hardpan light tan dirt, but it had an unobscured view of the entire path of the Sun during the eclipse and plenty of flat spots to set up the tripods for the camera. The light coloured more or less flat terrain also seemed hold more promise for observing the elusive shadow bands in the moments before and after totality than grassy parkland. (Alas, neither I nor anybody else at the site reported seeing them.) There was even a pile of rocks which made a perfect place to put the video camera, which due to luggage constraints was mounted on a small collapsible tripod intended for desktop use. After all, I expected to be looking up, not down, so there was no reason to insist on the most attractive surroundings for a site. As it turns out, I wasn't the only person thinking this way; by the time the totality neared there were several hundred people at this site, but the eclipse was high in the sky and there was plenty of room for everybody. The park along the north bank of the river also had a good view of the eclipse, but as I expected turned into a complete mob scene as the eclipse approached. There wasn't any trouble observing from there, but it might have been difficult finding a place to set up a waist-level tripod or video camera. bright stars—note Venus clearly visible to the left and above the Sun—but all around the horizon it's twilight because you're looking toward areas that aren't in total eclipse and seeing light reflected off terrain in those areas. Esfahan is surrounded in large part by light-coloured desert and there was some dust in the air, which may have made the effect more pronounced. The picture at the right was taken seconds before the onset of totality (notice the sliver of Sun reflecting from the car and the wan shadows cast by the people). Street lights have come on all over the city, and illuminated signs are blinking on atop buildings. Shortly before the start of totality, I aimed and started a video camera to record the event unattended, the results of which are available here as Totality: The Movie . I planned to observe all of totality visually, while simultaneously photographing the eclipse on colour slide film through a telephoto lens; the best images from this project appear in the Eclipse 1999 Photo Gallery . A summary of lessons from the video and slide photography projects appears on the Solar Eclipse Photo Tips page. Other non-eclipse photos from various sites we visited in our week in Iran are available in Images of Iran . Sky above Esfahan at mid-totality, courtesy of Your Sky .